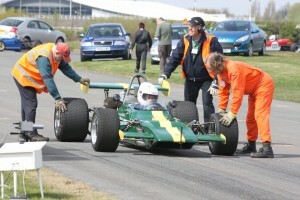 For well over a decade Liverpool Motor Club has been running its season of highly popular Sprints on the Club Circuit at the historic Aintree Motor Racing Circuit. See our Club Calendar page for details of all the championships invited to our events this year. Sprinting is one of the oldest forms of motorsport, having been established in the 1890’s. The cars start one at a time, competing against the clock and the fastest one wins. Well OK, it’s not quite as easy as that. It’s obvious that someone driving a Mini is not going to stand a chance of beating a Porsche or a 2 litre single seat racing car, so we split the cars into classes of similar vehicles. See a video documentary about our sprint events HOT LAPS AT AINTREE. In the morning, each driver is given two practice runs, at an interval of about an hour. Although the times for these practice runs are recorded, they do not count toward the results. Then the competition really starts, with two, three or often even more timed runs per driver, as each tries to set his or her overall fastest run of the day. Each car has a small vertical black metal strip on the front, called a timing strut. The start line crew use this to help line up each car just behind a detector beam at the start, and as the driver sets off, the strut breaks a beam of light to trigger a very accurate clock which times the car until it passes through another beam at the finish line. The elapsed time then reveals who is the quickest driver. Well that sounds easy, but when we are timing to 100ths of a second, it all gets pretty intense for the driver. And often with 700+ starts in the day, the start line crew have a busy day ahead! A link to the results for our events usually appears in the tab on the right of our website on the Monday after each event. We often publish a time for the first 64ft from the startline. This gives a great indication of the accelleration of the car – A time of 2 secs to the 64 feet mark equates to an acceleration of 1G. Have you competed in a car before? You’ll need to join an approved motor club like Liverpool Motor Club and obtain a “Non-Race National B” or higher competition licence from Motorsport UK (the Motor Sports Association). See their Introduction to Sprinting for background details and links to more detailed information. Then have a look at our event regulations. Depending on your car, you’ll need some safety kit, starting with fire resistant gloves, an approved race suit and helmet. Then, provided your car complies with the rules, send in your entry form & get ready for your first event. And have a look at the Go Motorsport website for lots more information too. We strongly recommend that you come along to at least one event before you start out, to talk to other competitors and watch what goes on during the day. This way, you’ll get a much greater appreciation of what to expect when you turn up at your first event – and our competitors love to talk almost as much as they love to drive! Don’t forget, if you are also taking part in a few events in addition to those at Aintree, you could be eligible for an award by joining the Liverpool Motor Club Speed Championship – the Best in the North West! Want to know more about the basics? Then have a look at TurboRussell’s short film on YouTube where he gives great advice about getting started. And a bit of in-car action, with pedal-cam too! 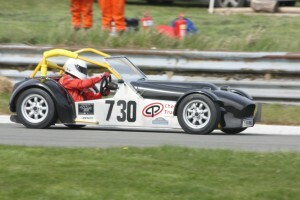 There’s a great article on our Track Days page describing how to drive a lap of Aintree quickly. It contains a lot of detail about lines for each of our corners that applies to sprints too. You can download it HERE and save it on your computer to read and re-read whenever you wish. A lap of Aintree – Really Useful Advice. The three Aintree Sprints are qualifying rounds of various other regional and national Championships. Our Club Calendar page has details of all the championships that have accepted invitations this year. 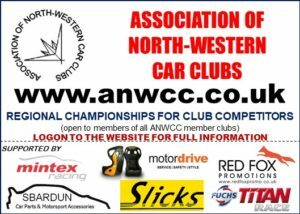 In addition, a competitor who is a member of a motor club that belongs to the ANCC, ANWCC or SD34 is automatically eligible to take part in any of our sprints, whether or not he or she is a registered contender in one of their championships. Spectators are welcome at all our events at Aintree, and it’s not expensive to get in. Just see our Spectator information page for more details. In common with all UK motorsport events, Dogs are not allowed in the spectator areas, not even well behaved ones on the strongest of leads. Sorry! And Drones are prohibited at all UK motorsport events too. Adult admission is just £5 , accompanied kids under 16 get in free, and there’s free parking, free entry list and free access to the whole of the paddock where you can see the cars close up and talk to their drivers too. There’s toilets and great food & drink available at the 5* cafe in the paddock where you can even sit and relax on the patio whilst all around you are preparing their cars for the next run. Event Timetable: Gates open for spectators at 08.00. There will be two practice runs for each competitor, starting at about 09.30. The first competitive runs start staright after 2nd practice and often start before lunch. The lunch break of about 40 mins takes place sometime between 12.00 and 14.00. After lunch, more competitive runs take place and depending on the number of cars that have entered the event, there may be three, four or even more competitive runs for each competitors until the event finishes at around 16.30. Want an independent opinion of our Aintree sprints? I found myself in Aintree last weekend, a place well known for its connections with horsepower and racing – yep, part of the old Grand Prix circuit was being used for a sprint event run by Liverpool Motor Club. It’s a surprisingly simple formula for motoring fun; just bring your wheels of choice to the start line, put your foot down, hold on for dear life and hope your engine doesn’t pack in. Which, in the case of one Caterham which left a half-mile of blue smoke and a similarly sized oil slick down the final straight, it definitely didn’t! The best bit, however, wasn’t watching everything from an E-Type to a Lotus Elise being nailed around the historic circuit’s corners; it was being able to wander around the paddocks and get up close to this mouthwatering machinery and have a bit of a chinwag with the owners. There is something wonderfully egalitarian about the whole event, because it doesn’t matter whether you’ve brought half a million quid’s worth of classic racing machinery or a Renault 5 GT Turbo. At Aintree, all that matters is getting the fastest time in your class. The one thing that summed that up more than anything else was clocking a lightly abused Renaultsport Clio 182 parked up next to an Aston Martin DB6. The two couldn’t be more different, but both of their owners were the epitome of loveliness and were there not to show off, but because they enjoyed putting their cars through their paces (and, without wanting to offend either, I bet their lap times weren’t dissimilar either). So the smorgasbord of car shows and “clubbie” sporting events across the region which always get into their stride at this time of year is something I can add to my list of things I miss about The North. Results and reports before 2007 can be found archived here.